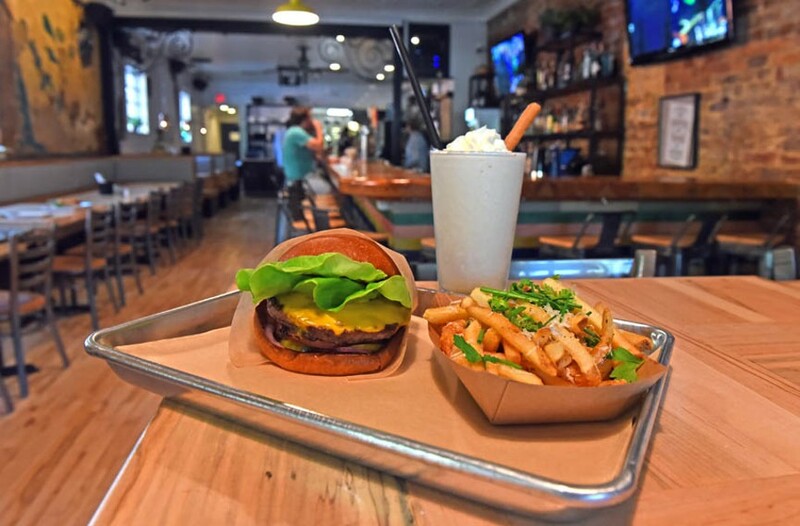 Beauvine Burger Concept takes American classics to the next level | Food and Drink | Style Weekly - Richmond, VA local news, arts, and events. Scott Elmquist The Beauvine Burger features American cheese, house pickles, red onion, tomato, bibb lettuce and Beau sauce. In the former space of rather legendary eateries of yore, the Texas-Wisconsin Border Cafe and Bellytimber Tavern, there is a new tenant: a bright, shiny penny called Beauvine Burger Concept. The exterior has been painted an appealing sky blue and clay red with a gleaming, Hollywood-style sign stacked on an awning above the door. The interior aesthetic is that bright white subway tile meets greenhouse thing that seems to be making over cafes lately (see also: Shyndigz). The bar is long, booths are cozy, and high-tops are tucked away in corners near the entrance. I might even call it cute. A quick scan of the menu reveals a sincere interest in using as much local food as possible — which, in this neighborhood, means it is well on its way to getting a stamp of approval. Behind the bar, Beauvine offers a few reasonably priced wines ($24 a bottle), and a healthy draft list. Cocktails are designed with seasonal interest and it's worth mentioning that they have frozen rosé ($7) and the Gin Blossom ($11), which is like a rosy pink gin martini, is perfect for summer. Kick off your meal with the smoked Gouda mac and cheese arancini ($8). The app includes three golf-ball size fritters with hard crispy shell exteriors, and milky mac and cheese inside. It's that soft, baked-in-a-casserole type pasta that melts in your mouth. Each fritter is a delectable two biter. The burgers themselves feature smallish, smashed patties, presented on buns in wax paper wrapping on silver metal trays. It's a perfectly reasonable size, easy to finish in one sitting without feeling overly stuffed. Every burger is cooked a consistent medium, with a light pink line in the center. The brioche bun is soft and has a vague sweetness to it, but equally important: It is practical. This bun is large enough in circumference to support the patty and toppings, and sturdy enough to stay together until it's gone. Beauvine offers eight artisan burgers, beginning with its namesake ($8), which is topped with American cheese, house pickles, sliced red onions, tomato, bibb lettuce, and the restaurant's own sauce. This is your classic. For something more substantial, try the steak frites ($10), with a few truffle fries stuffed inside, along with sauteed onions, lettuce and bearnaise sauce. The flavor combination is rich and ideal for a chilly winter evening, and there's something to be said for having the burger and the fries in the same bite. The Belle Ringer ($10), though, is truly excellent. During one visit, the bartender claims that of the eight signature combinations, this one is the most popular. That gives well-deserved street credit to Richmond eaters, because not only is it delicious, it is interesting. The top layer features herbed goat cheese, mâche lettuce and aioli, and under the patty you have pickled red onions and tomato jam. It mimics the classic accoutrement of an American cheeseburger, but with the elevated flavor profile of a sandwich from a French bistro. Outside of the burger combinations, the topping selection includes more compelling options like Rostov's French roast barbecue sauce, pickled jalapeños, buttermilk slaw, avocado and truffled enoki mushrooms, but if you want to build your own, expect to pay almost double the cost of one of their creations. Case in point: Bacon, a runny egg and avocado cost $2 each. And now we must discuss french fries. Some people regard the fries at Jack Brown's Beer and Burger Joint as a religious experience. The ones at Burger Bach tend to be on the crispier side, but that's nothing the cilantro dipping sauce can't fix. The truffle fries at Toast are worth the price. I personally love a soft greasy french fry, preferably from the bottom of a brown paper bag from Five Guys. The duck fat fries ($3.50), which don't automatically come with a burger, are fried to a light golden brown. They're tasty enough, but not memorable, and the smokiness from the duck fat is faint at best. The lattice of the sweet potato waffle fries ($3.50) is very thinly sliced, making for a crunchier bite, but again, not especially remarkable. Now, this critic recognizes that the french fry experience is entirely subjective, so my best advice is to go and try them for yourself. I would advocate for skipping fries altogether and going for an adult milkshake instead. The adult shakes ($10) are the standouts, and they alone make the trip worth it. Shyndigz, Station 2 and Boulevard Burgers and Brews have been on the alcoholic shake train for a while, but we don't see them on a ton of menus around town. Beauvine approaches the concept with high caliber ingredients and a focused menu. Each shake starts with a base of Homestead Creamery ice cream, so right off the bat you know it'll be rich and luscious. As a coffee lover, my first choice is the Brewed Awakening, featuring Rostov's French roast coffee and Belle Isle Moonshine. The silky creaminess mellows out the sharp jolt of caffeine, and that coffee-infused booze kicks in midway. The Secret Breakfast brings the sass with its vanilla ice cream base and pieces of the classic Fruity Pebbles cereal, Absolut Lime vodka and Grand Marnier. It might sound overly sweet for some, but it works, every euphoric gulp of it. Each shake is topped with whipped cream and a light, crisp gaufrette cookie. Open daily 11 a.m. - 2 a.m. Happy hour Mon. - Fri. 4 p.m. - 6 p.m.